The last of the Sevii Islands you must visit for Celio's quest, Three Island is full of Bikers harrassing the local residents. Head up north to enter the city and try to locate Lostelle. When you arrive at the port, you can already see some of those Bikers harassing the townsfolk. There is nothing for you here (at least not yet), so ignore the Bikers and the cave hole, and instead head north into the town itself. Three Island doesn't offer much at first; only a Pokemon Center and Lostelle's house are available. Soon you will discover that Three Island has been overridden with Bikers who want to take the town for themselves. Be sure and talk with the man standing near the P.C. He will mention that the P.C. system is finally working, which finally lets you access all your Pokemon and Items. Head slightly north to see some Bikers blocking the path. As usual, you'll have to save the day. Walk up to challenge the first Bikers (or decline if you want to wait). You'll be challenged to four straight battles with no chance to heal in between, so be sure your Pokemon are rested. After defeating Paxton, the rest of the bikers will run off. 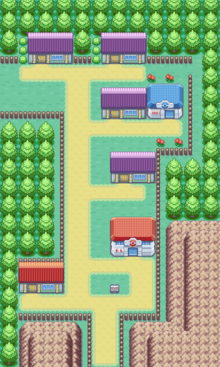 Talk to the two residents that you saved and one of them will gift you a Full Restore, while the other will mention that Lostelle has gone towards Bond Bridge. The rest of Three Island is now accessible, revealing a Pokemart along with several houses. The girl in the house with the purple roof will inform you that Lostelle was headed towards Berry Forest. When you're finished with the town, head out to Bond Bridge in search of Lostelle. Zinc: Use Cut on the tree on the east side of the town. PP Up (hidden): Use Cut on the tree on the west side. You'll find the item at the end of this path. This page was last edited on 29 June 2017, at 02:45. This page has been accessed 289,314 times.